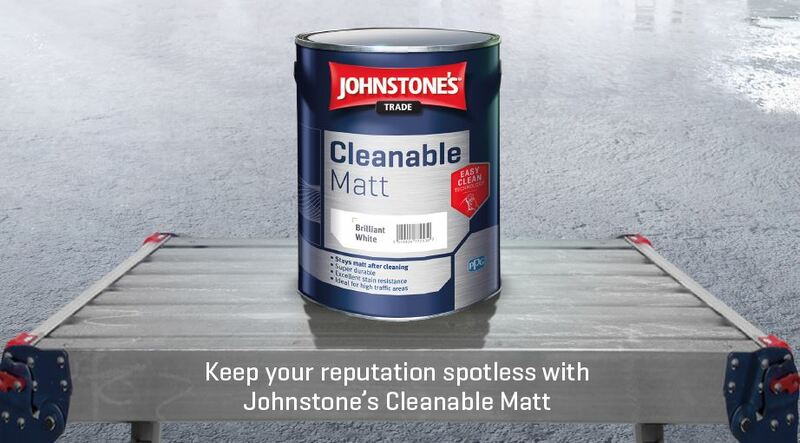 Johnstone’s Trade has been showcasing its innovative Cleanable Matt product in action on ITV4, with a series of adverts which demonstrate its easy clean technology. The adverts see professional decorators put the coating to the test with a variety of stains, including, soil, ketchup stains and syrup, demonstrating not only that the product helps to keep walls clean but also keeps painters’ and decorators’ reputations spotless. Designed with advanced easy clean technology, the product prevents stains from setting into the paint film, meaning painted walls can be simply cleaned with warm soapy water. Achieving ISO 11998 class 1 scrub rating, more stubborn stains can also be tackled with standard household cleaner*, returning the surface to its original, premium matt finish. Additionally, the product is 40 times more durable than standard matt emulsion. Cleanable Matt is tough enough for use in active commercial settings but is also perfect for domestic environments, particularly in high-traffic areas including kitchens, stairways and hallways. The coating helps to ensure a matt finish that lasts for longer, helping keep a new and fresh look at all times. The product can be easily applied by spray, brush or roller, and is now available in any colour.